Ola!!! I am back from my hiatus. For my first review this February, let me start with a product that comes from a country I will be visiting a few days from now. Baby Foot is an exfoliating foot mask and and cult favorite from the Land of the Rising Sun, Japan! In case you do not know, I have ugly feet. I have cracked soles and callouses here and there. My mom has thousands of theories why my feet are like these just as she has thousand of reasons why I have dark lip lines. Even my husband, then BF, always laugh at my feet whenever he sees my cracked soles. "Baby Foot care has a long history since 1997. It is invented to keep soft, clean and smooth barefoot and solve foot problems. With simple use, all dead skin layers peel off by natural turnover. Baby Foot is being continuously redeveloped to make it more comfortable and effective to use based on various researches as time progresses, thus it's gained the world recognition in over 50 countries now. After taking all dead skin off, your feet are reborn just like a baby’s - giving you healthy, beautiful feet back ever. Relief from disturbing foot problems brings the feeling of the real bare foot sensation and it will remind the memory of the childhood. Let's rediscover your feeling and sensation of the sole with Baby Foot." 1. Make sure to wash your feet with soap water. Then, wipe it dry. 2. These are the plastic booties containing 17 natural extracts and fruits acids. Wear these for 20 minutes but I wore these for 45 minutes because I wanted maximum results. 3. I used this tape to fold the excess material of the plastic booties and to ensure that my feet are immersed and soaked in the product. 4. Finally, rinse your feet with water and pat dry. Then, the waiting game begins. I was madly anticipating for my skin to peel off asap!! !I noticed dryness on the the first three days and a few skin cracks and peels. I got too excited for the peeling process to start that I forced peeling off my skin. My excitement did not help because I ended up with cuts and wounds. After my disastrous peeling attempt, I did not touch my feet. At the back of my mind, this product was not at all working for me. On my fifth day, I noticed that the flaking became more prominent especially when I soak my feet longer in the shower. Before I knew it, my feet were shedding off skin big time. I had to clean up piles of dead sloughed skin on the floor for days. It was quite addicting removing the dead skin off my feet. It was a happy sight and gross at the same time. Take note that it was not only my sole that was shedding skin but my entire foot was peeling off even my toes. Refer to my photos below. I love this product and I plan on using it again. It did a remarkable job in smoothing my feet. My feet are still soft and pink until (even after 3 weeks of using the product). I just noticed that it did not remove my callouses that well. Perhaps, on my next try, I will soak my feet in water on the third or fifth day from usage of this product to speed up the peeling process and I will not anymore forced the peeling to start. 1. Follow the instructions very well. Soaking your feet in the plastic booties is must. FY: I soaked my feet in the plastic booties for extra 20 minutes and it did not irritate my skin. 2. Do not be too excited and force your feet to peel in order to avoid cuts and wounds. Major peeling will come naturally. I even felt like I was a snake shedding off my old skin wherever I go. Emphasis on wherever I go. 3. Please do note that major peeling is a very gross sight. Your peeling feet will definitely catch attention so if you have special occasions to attend to, use this product at least a week before your event or special day. 4. 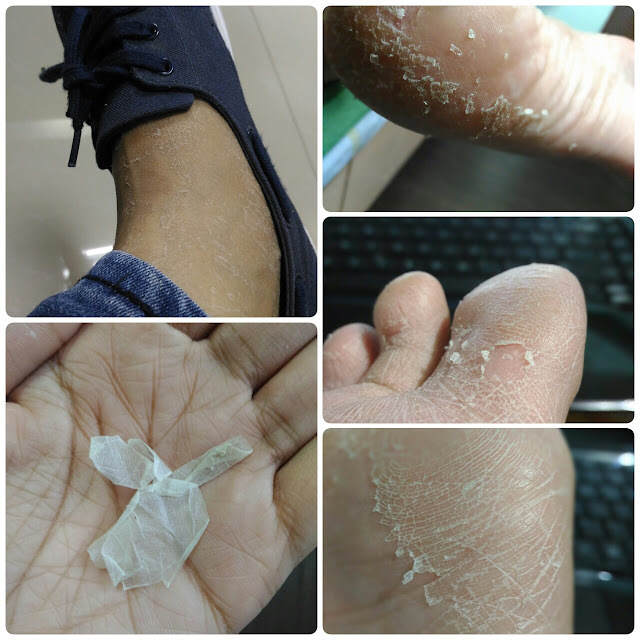 Soaking your feet in water for a few minutes (better if its all wrinkly) on the 3rd to 5th day will expedite the peeling process and will also make the peeling easier. 5. Please be reminded that entire process from the application/ soaking of feet in the plastic booties to the frustrating waiting game to the peeling itself will last for 7 - 10 days. Baby foot costs 830 pesos per pack and is exclusively available in Beauty Bar. Amazing :o But do they have instructions regarding how often to use this product? I imagine feet will become too sensitive if this product is used every month. Hi! Babyfoot ingredients aren't that harsh so you may use the foot peel 2 weeks after you used it the first time. Although, ideally, Babyfoot peeled feet lasts for 3-4 months. You may follow us in our social media accounts if you have more queries! Goodbye trips to foots spa now I can DIY this while relaxing at home ;) My mom will definitely love this! I seriously don't like going out just have foot spas 'cause I am seriously ticklish but still wanted to have softer feet. I've tried Etude House's Bebe Foot Mask and it worked wonders! I'll try this one out.